In 2010, the eyes of the world turned to Chile, where 33 miners had been buried alive by the collapse of a gold and copper mine. Over the next 69 days, an international team worked tirelessly in a desperate attempt to rescue the trapped men as their families and friends, as well as millions of people they had never even met, waited anxiously for any sign of hope. But 200 stories beneath the surface, provisions—and time—were quickly running out. A story of resilience, personal transformation and triumph of the human spirit, the film takes us to the Earth’s darkest depths, exploring the private lives and psyches of the men trapped in the mine, and depicting the courage of those who refused to give up. 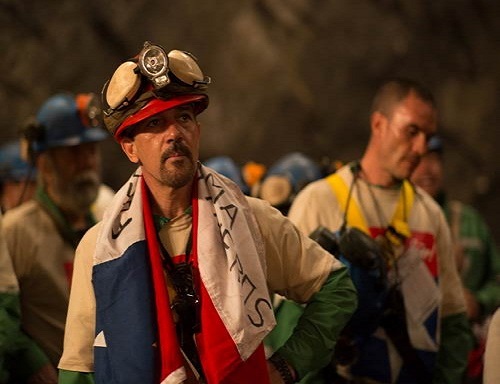 Based on the gripping, real-life survival story—and filmed with the cooperation of the real-life miners, their families and their rescuers—“The 33” shows the never-before-seen personal journeys and miraculous events that unfolded, above and below ground, which became nothing less than a global phenomenon.